In our scientific age, it’s hard to believe that the origins of any landform could still be unexplained, but this is the case with the extensive soil mounds and their encircling rock rings found northeast of Madras on the Shaniko Plateau. 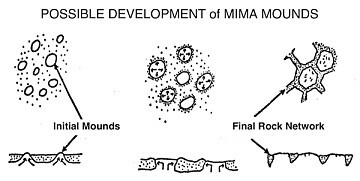 Known as mima (my-muh) mounds, several theories have been advanced about their formation, from differential erosion, to Ice Age freeze-thaw cycles, to soil movement by foraging gophers. But no one theory is widely accepted and these unusual land features remain a puzzle to geologists today. 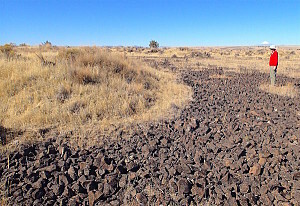 Hundreds of acres of this mima mound topography can be explored on BLM land near Shaniko. with their long axis following the slope downhill, often in long parallel rows separated by rocky strips. On slopes over 10%, the mounds and their stone rings are not found. 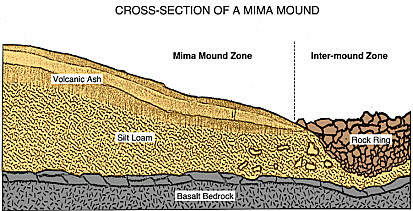 A cross-section of a mima mound (see chart) shows a surface layer of fine volcanic ash, over a consolidated mass of silt loam. Near the edges of the mound, rocks begin to appear in the soil profile, increasing in number and size toward the rock ring. Within the rock ring, the stones are vertically sorted, with the surface rocks being approximately twice the size of those in the lower layers nearest bedrock. 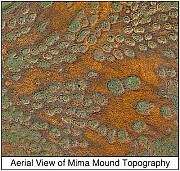 Mima mound topography supports two very different plant communities, one on the soil mounds themselves and one in the inter-mound network of stone rings and rock beds. Grasses are dominant on the soil mounds, both native perennials (mostly Idaho fescue and bluebunch wheatgrass) and invasive annuals (primarily cheatgrass). Common shrubs here are stiff sagebrush and gray rabbitbrush, along with the occasional juniper tree. Spring wildflowers include sagebrush mariposa lily, tailcup lupine, yarrow and various buckwheats. In contrast, plant life in the rocky inter-mound zone is more limited, due to the lack of soil. The dominant plants are fleshy-rooted species — biscuit root, desert parsley, upland larkspur and rock onion — all having underground bulbs that allow them to survive in the hot, dry rock beds. Where some thin soil does exist, one finds a few perennial grasses, such as Sandberg’s bluegrass, but increasingly just annual cheatgrass. Several sparse, rock-adapted wildflowers provide a bit of additional color to these scablands in spring. processes, with later erosion leaving soil mounds within the rocks (see chart). It’s even been suggested that mima mound topography was created by severe earthquake shaking in the distant past! One intriguing recent theory is that the mounds and rock rings were formed over centuries by pocket gophers, which nest in the soil mounds but tunnel out under the rock rings foraging for the fleshy bulbs growing there. By tunneling beneath the stone rings, the gophers slowly and progressively move the shallow inter-mound soils toward the mounds, leaving the rocks to settle in place in the rings. Though a fascinating theory, it’s far from a universally accepted one. Of the thousands of acres of mima mounds on the Shaniko Plateau, nearly all are on private land. But several hundred acres can be accessed on public BLM land from Rooper Road, a 3-mile dirt track running west off the paved highway between Shaniko and Antelope (see map download below). When dry, Rooper Road can be driven by most passenger cars, with caution for the occasional rocks and ruts. However when wet, in the winter and early spring, it should not be driven by any vehicle, as it turns into a slick mess of gumbo mud. Also, please respect the private land signs at various points along the road. The largest mima mounds are found at the 0.5 mile point on Rooper Road (see map download). One can park on the road’s edge here (making sure not to block the road), walk north through the barbed wire fence, and then explore the mounds for a half mile northwest on public land. At 1.6 miles on the road, the mima mounds to the north are arrayed in interesting parallel rows down the sloping hillside. From 2.6 to 3.0 miles, there are extensive mima mounds to explore for over a half mile south of the road. Finally at 3.1 miles, Rooper Road ends at a locked gate. Beyond are private ranch lands and a 380-acre Nature Conservancy preserve dedicated to scientific research on mima mounds.